Soundproofing America is your number one source for Green Glue. 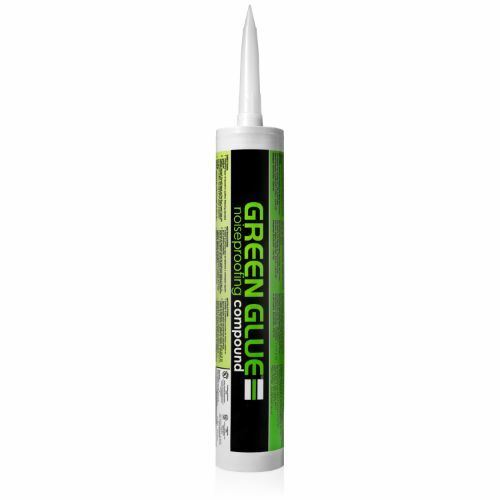 Green Glue is one of the most cost effective solutions for soundproofing large areas currently on the market. A highly advanced and easy to apply soundproofing material, Green Glue can be applied between layers of standard drywall and requires no demo to use in existing space. Green Glue has been tested in independent laboratories and has proven to be one the most impressive sound proofing products ever invented. Green Glue works by acting as an elastic dampener between layers of drywall, and therefore allows you to maximize your current space without having to install floating walls or ceilings. Green Glue is sold by the case, and twelve tubes will cover an astonishing 192 square feet! If you’ve been searching for an easy to apply soundproofing agent that won’t break the bank, your search is over. Soundproofing America’s low price of just $239.99 per case (shipped price-continental US) and $295 for five gallon tub (shipped price-continental US) any available soundproofing material makes Green Glue one of the absolute best values in noise elimination. The Cases of 12 tubes are good for 192 sq ft of coverage at 2 tubes per sheet and the Green Glue five gallon pails are good for 365 sq ft coverage using two green glue applicator’s full of green glue per 4’x8′ sheet of drwall. Contact us by phone from 9am to 5pm P.S.T.or just order online from the link below, Monday through Friday or e-mail us anytime for more information on ways to utilize green glue with other soundproofing materials and products for the maximum benefit. View the GG Slideshow Now!